Ukraine’s interim PM Arseniy Yatsenyuk has offered to devolve more powers to eastern regions, where pro-Russian separatists are defying the government. 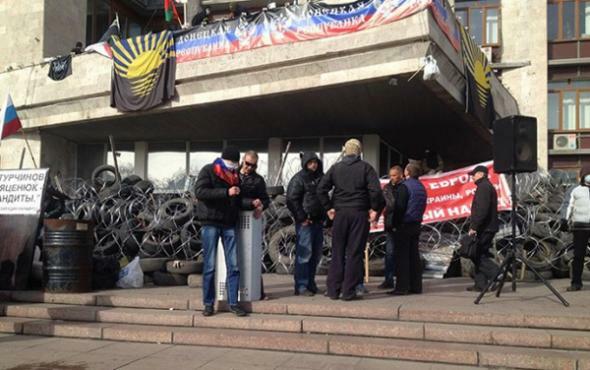 Arseniy Yatsenyuk is holding talks with regional leaders in Donetsk, where activists demanding self-rule are holding a big government building. It is not clear if the prime minister’s offer will satisfy the separatists. The threat of Russia cutting gas deliveries has now prompted Ukraine to seek gas from French and German firms. The EU says it can pump gas back to Ukraine with reverse-flow pipeline technology. Usually the Russian gas flows to Europe via Ukraine. In Kiev, Ukraine’s Energy Minister Yuri Prodan said it would seek the gas “on the conditions offered by European gas companies”, which he named as Germany’s RWE and “a French gas company”. On Thursday, Russia’s President Vladimir Putin said in a letter to 18 European countries that gas supplies to Ukraine could be cut if Kiev did not pay off its debts, and warned this could affect gas deliveries to Europe. In 2009, a Russian gas dispute with Ukraine led to gas shortages in several EU countries. Gazprom says Ukraine owes it $2.2 billion (1.4 billion euros) and recently doubled the price it must pay. The US has accused Russia of using energy “as a tool of coercion” over Ukraine, and says it is working to help Ukraine find gas and financing. In Donetsk, Arseniy Yatsenyuk urged regional leaders to tell locals that the Kiev government would ensure security and economic progress in the east, Interfax news agency reports. “In the framework of the changed constitution, we will be able to satisfy specific requests of every single region,” he pledged. But Kiev has rejected Russian pressure to turn Ukraine into a loose federation, fearing that more regions could break away and join Russia. The separatist protest follows Russia’s annexation of Crimea last month – described as the biggest political confrontation in Europe since the end of the Cold War. Near Donetsk on Friday seven miners died in a gas explosion, apparently unrelated to the current tensions. The mainly Russian-speaking region is dominated by Soviet-era coal-mining and heavy industry. Arseniy Yatsenyuk pledged that the Russian language would keep its official status in the region, in parallel with Ukrainian. Language is a highly sensitive issue in eastern Ukraine, where ties with Russia are strong. The billionaire industrialist Rinat Akhmetov – reckoned to be Ukraine’s richest man – is participating in the talks. NATO says up to 40,000 Russian troops are massed near Ukraine’s eastern border. Russian Foreign Minister Sergei Lavrov called for legal guarantees of Ukraine’s neutrality, reminding NATO that it should not try to draw Ukraine into the alliance. Arseniy Yatsenyuk is also expected to travel to another eastern city, Dnipropetrovsk, which has also seen protests. Activists in Ukraine’s mostly Russian-speaking east have also been occupying a state security building in the city of Luhansk, with gunmen armed with Kalashnikov assault rifles among them. Ukrainian officials are trying to negotiate a deal whereby the protesters would vacate the buildings in return for protection from prosecution. The interim government accuses Russia of orchestrating the unrest, as a provocation similar to the anti-Kiev protests which gripped Crimea. Russia denies the claim. Talks are due to take place in Geneva next week between Russia, Ukraine, US and the EU – the first four-way discussions since the crisis began.